A trailhead is the point at which a trail begins, where the trail is often intended for hiking, biking, horseback riding, or off-road vehicles. 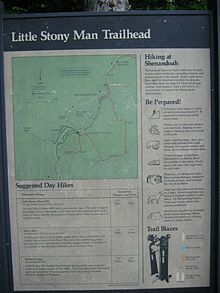 Modern trailheads often contain rest rooms, maps, sign posts and distribution centers for informational brochures about the trail and its features, and parking areas for vehicles and trailers. Historically, the cities located at the terminus of major pathways for foot traffic such as the Natchez Trace and the Chisholm Trail were also known as trailheads. For mountain climbing and hiking, the elevation of the trailhead above sea level is given to give an idea of how high the mountain is above the average terrain. Look up trailhead or trailheads in Wiktionary, the free dictionary. This page was last edited on 14 March 2019, at 20:13 (UTC).